The civil lawsuit seeks systematic changes to how the university handles reports of sexual misconduct. In the lawsuit, Tess Herman alleges Dr. Yusuf Kalyango made inappropriate sexual advances towards her and then retaliated when those advances were rebuffed. Herman also alleges she informed two university professors, Dr. Judy Millesen and Dr. Jeremy Morris, about Kalyango’s conduct, both of whom failed in their duties as mandatory reporters and that journalism professor Mary Rogus attempted to persuade her not to report Kalyango to the university. Herman was a graduate student pursuing two Masters degrees, one in journalism and the other in environmental studies when the alleged sexual harassment occurred in 2017. In addition to monetary damages for Herman, the lawsuit seeks to force Ohio University to take steps to change its system of reporting of sexual misconduct and how trains mandatory reporters. Ohio University says in a statement that it does not comment on ongoing litigation. ATHENS (WOUB) — A civil lawsuit has been filed against a suspended Ohio University journalism professor and the university itself regarding a sexual harassment case. Attorney Michael Fradin filed the case against Dr. Yusuf Kalyango and Ohio University in the United States District Court Southern District of Ohio on January 20. In a statement to WOUB, Fradin said the lawsuit was being filed due to “continued indifference” by the university in regard to sexual harassment allegations. The filing comes as Kalyango’s appeals to a recommendation for detenuring were denied by President Duane Nellis. 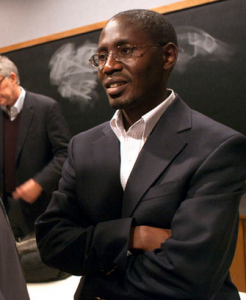 University spokesperson Carly Leatherwood said the case will now go back to a committee of faculty members to decide whether Kalyango will lose his tenure. No timeline has been given on that decision. In the civil case, Fradin is representing one of the women who has accused Kalyango of sexual harassment, according to court documents. Included in the court filings is the Memorandum of Findings from an investigation by the OU Office of Equity & Civil Rights Compliance which substantiated claims of sexual harassment and hostile work environment. The allegations included in that Memorandum of Findings make up one of three alleged cases leveled against Kalyango. Two of the cases are alleged sexual harassment, and one other alleges retaliation by the professor. Kalyango is also part of a review being conducted by the United States Department of State into financial records for federally-funded programs he directed. The review appears to be unrelated to the sexual harassment cases or civil lawsuit. Neither the Department of State nor the university commented on the status of the review. Court records do not state a date for the civil case to be presented in district court. Requests for comment were left Kalyango’s attorney, John Marshall. In previous comments by Marshall, he has denied any wrongdoing by his client.